Below is a grid of partial Nintendo NES games' partial cover art. 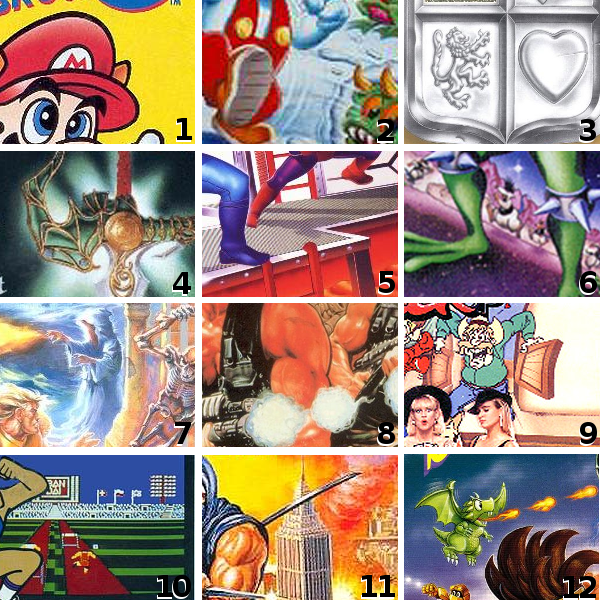 Fill out the quiz below with the correct game for each grid and you can win a free Nintendo game! Winner: The person with the most correct answers will win. In the event of a tie the person who fills out the form the fastest wins. Eligibility: Any member of the PriceCharting forums (accounts are free) is eligible. Ends: February 3rd 2012 at 11:59pm PST. All entrants will be notified of their scores via private message through the forum. We have updated our article about the rarest and most expensive Wii games. Three of them sell for more than $120 in brand new condition. The article includes pictures of the games, the price, and why they are so expensive. 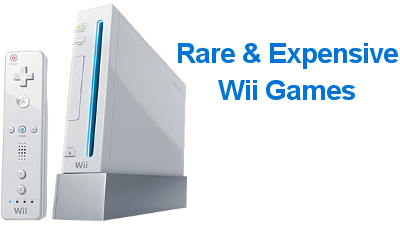 Read the article and see if you have any of the rare Wii games in your collection. Do you know what year the Genesis launched? Or how many games were released for the Genesis? What about the names of the games at launch? If you think you know the answers to these questions take our Sega Genesis quiz on our forum and see how well you do against other PriceCharting members. Sequels are big business in the movie industry. In 2011, 27 movies were sequels which equals nearly 20% of all movies released last year. When these sequels release in theaters they increase the prices of the original movies on DVD and BluRay. This can be very helpful for DVD collectors to know so you can save some money building your collection. The chart above shows the DVD prices for the original movies before, during, and after the sequel released. 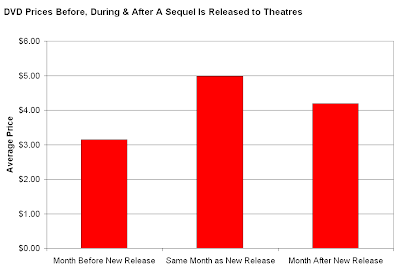 The average price increased 58% during the month of the sequel's release. Then the month after release prices decreased 16%. 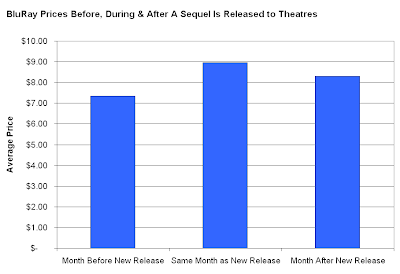 This chart shows the prices for Blu-Ray movies before, during, and after the sequel released in theaters. Blu-Ray prices didn't increase as much as the DVD prices with an average increase of 22%. 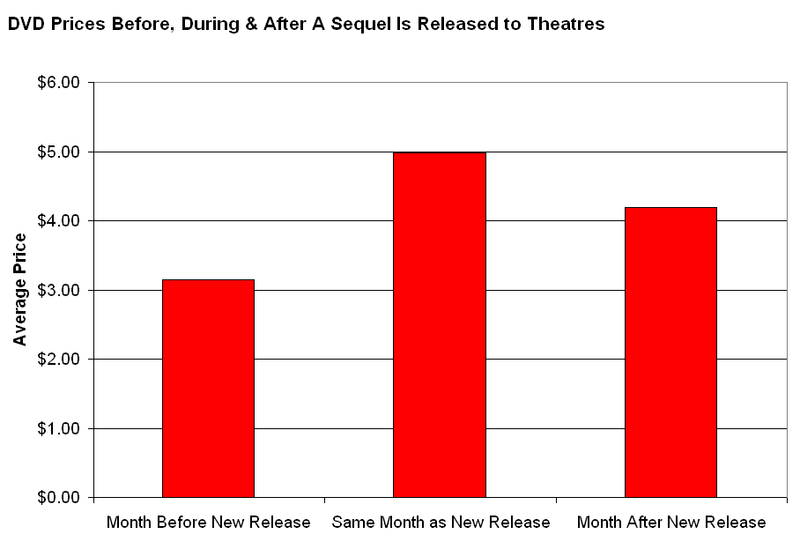 The subsequent decrease was smaller as well, only dropping 7% a month after the sequel. Knowing that DVD and Blu-Ray prices increase when a sequel comes out can save you money as a collector. Be sure to buy the original movies before the sequel releases or you will end up paying a 50% premium. Or if you are looking to sell some movies from your collection, think about selling movies the same time a sequel is released. 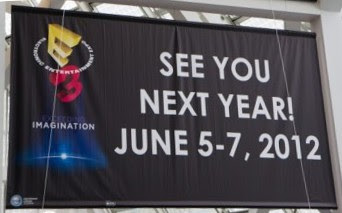 E3, the biggest video game convention in the USA, is right around the corner - June 5-7. The show is huge. There are so many new games, new consoles, and new hardware announcements that we need some help to cover it all. The show is open to industry insiders only so not just anyone can attend. We're offering a pass to E3 to one of our readers so you can help us write about E3 this year. 2. We will look at people's writing style and creative ideas for threads to decide who is the best writer and would do the best job covering E3. To be eligible you must be 18 or older. E3 doesn't allow people under 18 to attend. PriceCharting is a fairly small site. We can't afford to pay your way. The writer will have to pay for their own flights and hotel. You might be able to stay with us at our hotel to save money. This is a great chance for you to attend the "Super Bowl of gaming" and maybe break into the world of video game writing. Join the forum today and show off your writing ability. During the holiday season video games and movies are popular gifts. During November and December almost 110,000 video games and 93,000 movies (DVD & BluRay only) sell per week on eBay. 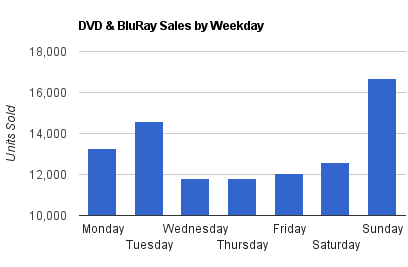 For both movies and video games Wednesday and Thursday have the fewest sales. 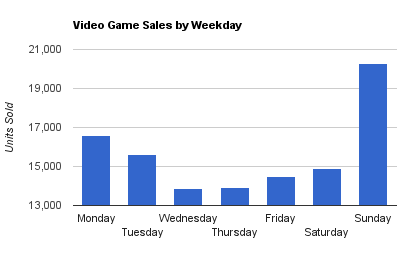 Sunday is the biggest sales day by a large margin, with 40-45% more sales per day than the slowest day. 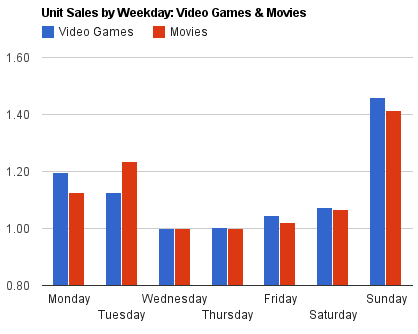 Besides Sunday, Tuesday is the biggest unit sales day for DVDs but Monday is the next biggest for video games. The chart above compares the average unit sales by day of the week for movies and video games so you can better see the differences. If your selling a game or movie on eBay with a fixed price, you are much more likely to sell it on a Sunday than any other day of the week. But the prices are usually higher on Wednesdays so if your choosing when to list an auction, ending it on a Wednesday might be a good idea. There will be less competition and usually a higher price. There are some rare Wii games that are hard to find in the "wild" and sell for a premium to their original retail price. Below is a list of the Wii's rarest and most expensive titles. The list is ranked by average sales price per game in new condition. One Piece Unlimited Adventure is an adventure game based on the One Piece anime from Shonen Jump in Japan. Bandai published the game in the USA at the same time the new One Piece series was airing on Cartoon Network. The game sold poorly and was the last One Piece game released in the USA (as of Jan. 2012). The sequel One Piece: Unlimited Cruise was released in Japan, Europe, and Australia but never in the USA. Because of the poor sales the game is hard to find at any stores and fans of the anime keep the price of the game very high. Dragon Ball Z Budokai Tenkaichi 3 is a fighting game with the Dragon Ball Z anime characters. The first two games in the Budokai Tenkaichi series were released on the PS2. Dragon Ball Z Budokai Tenkaichi 3 was released on the PS2 and Wii, but the Wii version is much more expensive. Tenkaichi 3 was published by Atari but all new Dragon Ball Z games are published by Bandai. This complicates any plans to republish the game. More than likely the game will not be republished and it will stay rare and expensive. In 2009 the Wii received an F1 series racing game from Codemasters. They never confirmed if it was poor sales of the Wii version or the lower graphical abilities, but the 2010 and 2011 versions bypassed the Wii and released on 360, PS3, and PC only. 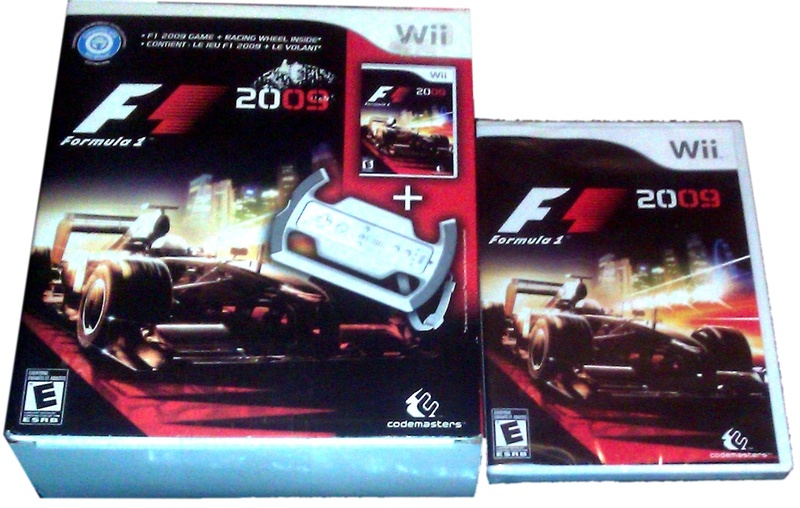 With the high prices for sealed copies of F1 2009, the best bet is the game didn't sell very well and is hard to find. Formula 1 fans help keep prices high because this is their only chance to race through an F1 season on the Wii. Fritz Chess is a chess game released by Deep Silver in 2009. The game is based upon a German chess program that teaches kids how to play chess and also allows players the ability to get a chess point rating by playing against the computer. The game was originally sold at a budget price of $29.99 but now sells for $110 when brand new. Deep Silver is rumored to have only released the game in select markets in the US as a limited release. The exact number of units produced isn't available, but is very small. Metroid Prime Trilogy includes Metroid Prime 1, 2, and 3 in one collectible metal case. The first two games were originally released on Gamecube but the Trilogy versions changed the controls to match Metroid 3's Wii motion style controls. The game was published in August 2009 as a collector's edition and true to the name within 6 months Nintendo had discontinued the game. Prices have steadily increased since this announcement in January 2010. In 2007 Atari announced a licensing agreement with the International Federation for Equestrian Sports (FEI) to make realistic horse video games. You get to groom your horse, ride it, take it to the vet, and compete in shows. In 2009 Atari released the last of these games for the Wii, My Horse & Me: Riding for Gold. Atari stopped publishing the game in the USA though it is still published by Bandai Namco in Europe. Atari doesn't even acknowledge the games existence on their website anymore so it is unlikely to republished by them. An exercise game that is compatible with the Wii Balance Board and Wii DanceDance Revolution dance mat. You walk in place to the beat of different songs and your avatar on screen walks through different locations and sceneries. The game is no longer available at any major retailers because it was discontinued by Konami. Prices jumped in December and early January of 2012. Demand might be driven by weight loss and exercise New Year's resolutions so the price spike might only be temporary. Godzilla Unleashed allows you to destroy cities with Godzilla and other monsters. It also includes party modes for multiplayer. The game originally released for $50 and resale prices quickly dropped in the first several months. But in early 2010 prices started increasing again and the game now sells for more than the original MSRP when brand new. The game was published by Atari, which like Dragon Ball Z and My Horse and Me, might help explain the increase in price. Dokapon Kingdom is a board game and role-playing game in one. It is similar to Mario Party games with a board and random dice rolls, but with very deep RPG elements and strategy built in too. The game is published by Atlus and Atlus is known for printing limited quantities of their games and for games that keep their value over time. Dokapon is no exception. The game is fairly difficult to find brand new so it continues to sell for the original retail price nearly three years after release and prices continue to go up. Kororinpa is a marble rolling maze game similar to Marble Madness for NES or Super Monkey Ball. You tilt the Wii remote to get the ball to roll through the maze and reach the goal. The game is fairly easy to find in used condition, but is no longer available brand new. The publisher, Hudson, closed in 2011 and was purchased by Konami later that year. Konami has canceled all Hudson projects and most likely will not reprint Kororinpa. Skylanders Spyro's Adventure is a new Spyro game released on all consoles. The game comes with figurines that you can import into your game to play with. Activision sells other action figures separately in hopes that people will buy the game and then buy and collect the action figures too. The high price is due to higher demand than Activision predicted during the 2011 holiday season. They will most likely continue production and supply will catch back up with demand and the price will drop. Hasbro Family Game Night Fun Pack is a compilation of the board games included in Family Game Night 2 and 3. It includes games like Life, Operation, Jenga, Twister, and more. This two game collection released in the beginning of November 2011 for $50. The game has continued to sell at the same price for the last two months, but more than likely EA will continue production and the price will drop in the future. For Mario's 25th Anniversary Nintendo released a "limited edition" Mario collection with Super Mario Bros 1, 2, 3 and the Lost Levels. It was originally released in December 2010 with very limited quantities and for a short time the game was selling for $90-100 in brand new condition, which is nearly triple the original MSRP of $29.99. In March 2011 Nintendo announced they were reprinting Mario and prices quickly dropped down to $30 with the larger supply. After the second shipment sold out prices have started increasing again. If Nintendo refrains from printing a third time, Mario All-Stars will probably continue to climb this list. Beyblade: Metal Fusion Battle Fortress follows a game specific story with characters from the animated series. You battle your customized beyblades to try to become the World Champion and can also battle against your friends. This is another Wii game released by Hudson. Like Kororinpa, Beyblade will probably never get a reprinting. It will probably keep these high prices in the future and might even get more expensive when the original supply runs out. Kirby's Return to Dream Land was released in October 2011 and is a brand new story with Wii remote style controls. The game is similar to other Kirby platformers with skill copying abilities and also includes up to 4-player co-op. The game was only released four months ago, but it has kept its value very well during this time period instead of quickly dropping in price like most other games do. If Nintendo pulls a Metroid Prime Trilogy and discontinues Kirby it might be able to keep these high prices in the years to come. Sudoku Ball Detective is a Sudoku puzzle game wrapped around a sphere. Each sphere has six different Sudoku's on it and you use the Wii remote to rotate the sphere and solve the puzzles. Sudoku Ball Detective is very elusive and its very existence has been questioned. The Sudoku Ball website claims the game was released for the Wii and the developers confirmed in an interview that the game was released. More importantly the game did sell on eBay one time for $37 used. The current new price is unknown but would be quite a bit higher. See Prices For All Wii Games. PriceCharting.com has daily updated prices for every Wii game and most Wii consoles and accessories.